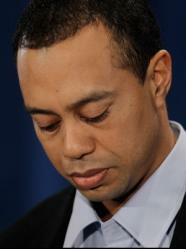 Chicago, MI (USA) -- Revelations by Tiger Woods last Friday that he will turn to his Buddhist faith as he seeks to atone for his infidelity and the damage it wrought is a wise decision, according to Chicago area Buddhists. But his path will be a challenging one, they said. "With Buddhism, there's no easy way out," said Rachael Conniff, just before morning service Sunday at the Buddhist Temple of Chicago. "There's no magic way for forgiveness. You can't pray it off. You can't pay it off. You have to work. It's what you make of it. Buddhism is a lot about self-reliance and self-responsibility, so if he's serious about that, then he will get back on track." In his first public apology last week, Woods said he's dedicated to becoming a better person and will return to his Buddhist roots. His mother is a Buddhist and native of Thailand. "I actively practiced my faith from childhood until I drifted away from it in recent years," he said. "Buddhism teaches that a craving for things outside ourselves causes an unhappy and pointless search for security. It teaches me to stop following every impulse and to learn restraint. Obviously, I lost track of what I was taught." Buddhism, a faith practiced by an estimated 350 million to 500 million globally, has served Woods well in his professional career, said Bill Bohlman, who has attended the Chicago temple for about 20 years. "A lot of his Buddhist upbringing is the reason he's such a good golfer, the idea of being in the moment and letting the past be the past," Bohlman said. "He wouldn't focus on the last bad shot. He wouldn't carry it into the next one. He could have a bad tournament and go win the Masters. So, this was the underpinning of a lot of his success." But besides the importance of focus and concentration, Buddhism teaches the importance of dealing with one's desires and realizing the causes of one's unhappiness, said the Rev. Patti Nakai, associate minister at the Chicago temple. "A lot of attention is put on overcoming defilements, craving for this, craving for that," she said. "Craving is something you need to be aware of, and instead of letting it control you, you need to see where it's coming from. One of the tenets is analyzing your cravings, why do you want that so badly, and by doing this analysis, it starts to break it down." She and others said Buddhism does allow for forgiveness and redemption, but not in the same way as Christianity. She was addressing controversial comments Fox News' Brit Hume made earlier this year urging Woods to turn to Christianity because Hume didn't think Buddhism offered the forgiveness and redemption offered by Christianity. Buddhism "has no divinity figure to ask forgiveness from," but you learn from your actions and you move on, said Bohlman. It focuses on the need for followers "to get to that place where you can totally accept who you are and all the circumstances that brought about that," said Nakai. While there is no one "to wipe the slate clean," she said, "you, yourself, have to do the hard work of confronting what you did and hopefully finding ways from this point on to the future to do things differently, in a [non-destructive] way to yourself and the people around you." Nakai was pleased that Woods spoke about Buddhism. "It was a very good statement," she said. "I'm glad he made this. I hope people get a positive feeling about Buddhism from his statement."